Johnson, a Washington State University sociologist, teased apart the opinions of more than 20,000 people over more than four decades and saw that support for environmental spending consistently plummeted during the administrations of Jimmy Carter, Bill Clinton and Barack Obama, Democrats all. Johnson made his discovery using a statistical analysis that looked at poll respondents in terms of their age, the time period in which they were surveyed and the cohort of similarly aged people. Support for environmental spending consistently declines as people get older and one's cohort has only a modest effect on his or her environmental views. But one's relative support for the environment changes dramatically depending on which party is in the White House. Indeed, the current Republican-Democrat divide over the environment is about the same as it was at the end of the Carter administration in 1980, Johnson said. "What's driving the divide is really these presidential politics," he said. Johnson and Philip Schwadel, a professor of sociology at the University of Nebraska-Lincoln, publish their findings this week in the journal Social Forces. 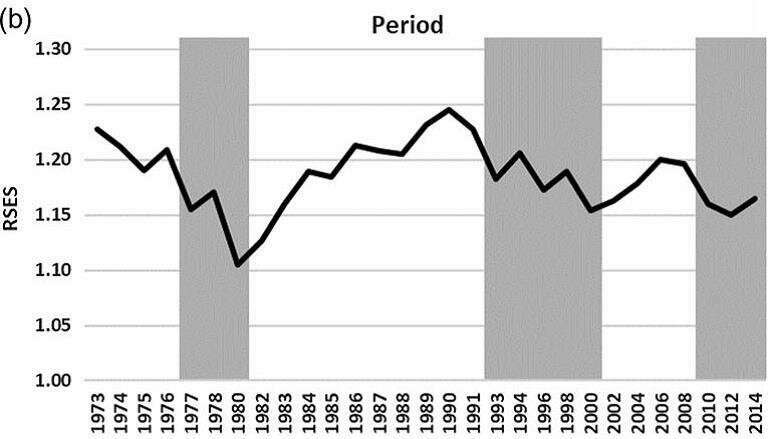 Their study used data from the General Social Survey between 1973 and 2014, covering what the authors call "the longest time span of any available set of frequently measured trend data on environmental concerns." Historically, Republicans have been pro-environment. Abraham Lincoln set aside California's Yosemite Valley for "public use, resort, and recreation," setting the stage for the National Park System. Teddy Roosevelt was "the conservation president." Richard Nixon created the Environmental Protection Agency. Overall environmental support was once so consistent that the editor of Public Opinion Quarterly in 1972 called it "a miracle of public opinion." But that support slipped by the end of the decade, Johnson and Schwadel write, "when President Carter was being mocked by conservatives for suggesting that Americans try donning a sweater before turning up the heat in their houses." The election of Ronald Reagan, a Republican, "marked a key turning point in the politicization of environmental issues," Johnson and Schwadel write, as Reagan ran on a platform that included changes in federal land control and rolling back antipollution legislation. Yet support for environmental spending bounced back under his two terms and the subsequent term of George H. W. Bush, another Republican. Johnson said the swings in opinion come largely from Republicans. Democratic support for the environment is consistently high, while Republicans tend to be mobilized when a Democrat moves into the oval office. "They get concerned about overreach an environmental policy," Johnson said. "They know that the government is going to be proactive on environmental policy so they're less supportive of it. They are usually opposed to a lot of Democratic presidential policies." When a Republican is president, he said, Republican voters will actually come to look pretty much like Democrats and Independents in their environmental support. The first Bush presidency took several pro-environment steps, including the U.S. Global Change Research Program and the ozone-layer protections of the 1990 Clean Air Act. Republican voters took the measures in stride. The outsize role of the presidency in environmental opinion is a testament to the office, said Johnson and Schwadel. "Presidents are leaders of their political parties and important drivers of news cycles," they write. "They also sit atop a large federal bureaucracy with considerable discretion over federal environmental policy, building a record of governance that political opponents may hold up for criticism, and to which partisans in the minority are particularly likely to be cued."